After visiting the Thiepval Memorial and Ulster Tower, we headed south west towards the coast and the town of Honfleur. We over-nighted in a small town called Forge Les Eaux about half way to Honfleur. Here there was a large aire operated by the campsite opposite. It was advertised as being open from March until 31st October at €8 per night including electric hook up. We arrived on 28 October and there were only 2 other motorhomes in the very large parking area. I noticed that there were no electric cables going to either of them. I parked up, got out my electric cable and connected it to one of the electric points…. nothing! It seems the campsite opposite had closed early and while they had kept the parking area for motorhomes open, the electricity had been disconnected for the winter. As well as that they had also removed all the water taps in the service area, so there was nowhere to fill up with water or rinse out the cassette. As there was only a short amount of daylight left, I didn’t want to try and find anywhere else, so we settled in for the night. It turned out to be the coldest night yet with temperatures dropping to freezing point. I have never felt so cold in the motorhome and the cold kept me awake most of the night. We really missed the electricity to switch on our heaters that night! Next morning we were up and away, with the cab heater on full blast! We wanted to get to Honfleur for about lunchtime as we read the aire there only had a limited number of EHU points and it was first come first served. After a quick stop at the Super-U supermarket in Forges Les Eaux for some essential groceries and diesel, we were on the road to Honfleur. We arrived at Honfleur around 12pm. The aire here is huge and can accommodate a couple of hundred motorhomes and there were already a large number of vans parked up. We spotted a gap in one of the rows of motorhomes and pulled in….. right beside an EHU point and water tap. Bingo, that will do nicely. The electric supply at the aire is only 5 amps, but this was enough to run our 2 small oil filled radiators and keep inside nice and warm during the day and night. The aire here works on a pay-and-display basis. You purchase your ticket at one of the machines and display it in your windscreen. €11 for 24 hours whether you have EHU or not, so we were glad we had secured a prime spot. If you want to stay longer you buy a new ticket each day with a maximum stay of 3 nights. Although we didn’t see them, apparently the Gendarme come around checking that all vehicles are displaying a valid ticket. After a quick bite of lunch we headed out to explore the town. 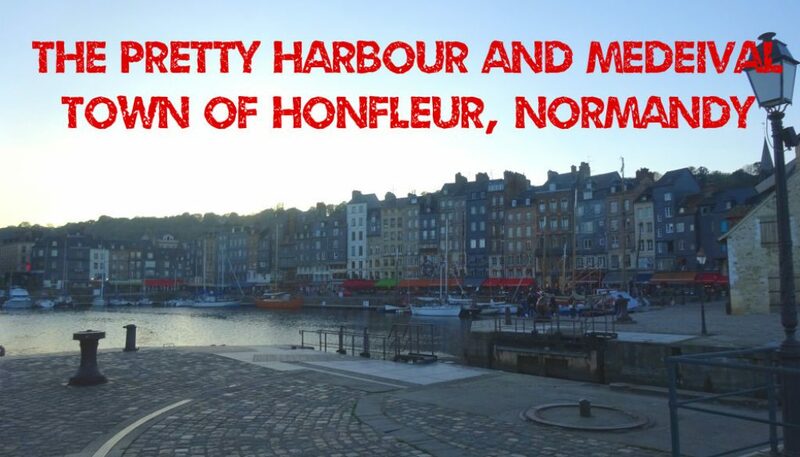 A short 15 minute walk back over the bridge at the marina where the aire is situated, turn right, and you arrive at the main attraction of Honfleur, its 16th century harbour. Honfleur is situated around an inlet from where the River Seine flows into the English Channel. It is in the heart of the Calvados region in Normandy and you will see the Calvados apple liqueur for sale everywhere in the town. The Vieux-Bassin (old harbor) is often described as the prettiest in France and I wouldn’t disagree. It is lined with tall narrow 16th century town houses. Once owned by wealthy merchants, they now house restaurants which stretch along its whole length with tables and chairs spilling out on to the quay side. Honfleur harbour is one of the most painted scenes in France by artists. Where once the harbour would have been filled with small fishing boats and ships bringing precious cargoes from abroad, it is now filled with leisure sailing craft. The other side of the harbour has more of the tall merchant town houses and in the centre is the old Church of Saint-Étienne which has been turned into a historical museum about old Honfleur. Even at this time of the year the town is crowded with tourists. It may have been a school holiday in France as there were lots of children there with their parents. The crowds were particularly heavy around the harbour cafés and main shopping streets. As you head slightly deeper into the town you reach a main square where St Catherine’s Church is situated. Built out of wood from the surrounding forests it dates back to the 15th century. The roof inside resembles an upside down double hull, as it was mainly built by shipwrights of the time who were highly skilled woodworkers of this design. At the rear of the church is the separate bell and clock tower. Shopping in the town is dominated by art galleries, chic boutiques and delicatessens selling calvados, regional caramels and sweets and even flavoured salts. The town in the past had 3 huge timber salt stores, the salt being used to preserve fish. Michelle particularly liked the cutaway traveller figure outside one of the many art galleries. As you roam deeper into the town away from the main shopping drag, the crowds thin out and the back streets become even more quirky with medieval half timber framed houses. Many of these are being renovated inside. I imagine as the town lost its commercial edge, many of these houses became unloved and derelict. But with the huge influx of tourism in the town they are now being snapped up by savvy investors and converted into boutique holiday accommodation. We head back through the town and around the other side of the Vieux-Bassin for a final photo call of this famous view in the dimming light. As we head back towards the aire we see the looming Normandy Bridge (Pont de Normandie) in the near distance. It was built in 1995 and is a 215m high and 2141m long cable bridge spanning the Seine river linking Honfleur to Le Havre. It is one of the main toll routes into the area, but we had avoided toll roads and didn’t cross over its massive span. The height of the bridge still allows large ships to sail up the Seine river and the bridge has now become an iconic symbol of the area. With this we headed back to the warmth of our motorhome and planned the next part of our journey around the other side of the Cherbourg peninsula to Mont St Michel. We are Alan and Michelle - Going Nomad. A 52 year old couple from Northern Ireland who have simplified their lives and have hit the road in their motorhome. We are sharing our travels in the hope to inspire others to find their own travel adventure. Thiepval & The Heart Of The Somme WWI Centenary	All Aboard The Mont St Michel Express!